It begins reasonably enough, with poor lonely Aarti (Raakhee) pining for her once-attentive but now neglectful husband Sunil (Sanjeev Kumar). Sunil is a wildly successful surgeon, and completely obsessed with his work. He is also a jackass who thinks nothing of making fun of his wife to her face at a party, and when he does speak to her he’s condescending and dismissive. I want to slap him silly from the get-go. Since her only reaction to all of this is passive-aggressive self-pity, I pretty much want to smack some sense into her too; so within five minutes I find myself detesting the hero-heroine, never a good sign. I stick with it though, thanks to this little declaration at the beginning. You know how I love to identify locations, although it does pain me that such a very bad film was dedicated to the so-very-talented Dwarka Divecha (who also makes a cameo appearance as another doctor). Happily we are soon in Khandala, where Aarti’s sister Radha (Bindu) lives with her ex-military husband the Major (Sujit Kumar) and their son Raju (Master Raju). They have invited Aarti and Sunil down to celebrate Raju’s birthday and so that Aarti and Sunil can check the progress of a house they’ve bought there, which is being decorated. Sunil promises faithfully that he’ll make it (it’s clear from conversation that he’s blown them off before too) but of course he doesn’t. Aarti leaves without him and on the road indulges in teary memories of happier times with her husband. I’m unimpressed, and very happy when she arrives at her house. The interior decorator hired by the Major to do up Aarti’s house is none other than an old college classmate, Vinod (Shashi Kapoor). Vinod carries a photograph of Aarti in his wallet and a torch for her in his dil. He flashes back to their roles as Salim and Anarkali in a school play, where they are almost as hammy as they are in this movie. Vinod is also everything that Sunil is not (besides handsome): funny, happy-go-lucky, attentive, and he soon has Aarti laughing. Sunil calls to find out if Aarti has his pistol (she does) and why she hadn’t contacted him before she left. He’s a little miffed, and puzzled at her cheerful demeanor and promises to come down for Raju’s birthday party that evening, which is being held in their house since Vinod has finished his work there. Of course, he doesn’t show up which surprises nobody except Aarti. Vinod sees her unhappiness and cheers her up with a song with Raju’s young friends; then the next day he overhears her confiding in Radha that she has decided not to return home unless her husband comes and gets her (minor “yay?”). He begins spending time with her (behaving with massively irritating and forced good cheer, oh Shashi) and Aarti blossoms under his hyperactive friendship. Radha notices and gets her petticoat in a twist with her fervid imaginings. Arggghhh. I notice that whenever Aarti and Vinod are together strains of “Pal Pal Dil Ke Paas” play softly in the background. Aarti treats Vinod with a sisterly affection and begins confiding her sorrows in him too (at one point telling him that she wishes she had everything to do over again), while Radha lectures her on morality and appearances. Then Sunil forgets their wedding anniversary, prompting another flashback where we learn that on a past anniversary Aarti had gifted Sunil with baby news, but then miscarried (with Dwarka Divecha as the OBGYN). Oh the misery! Sunil’s assistant Chaturvedi reminds him that it’s his wedding anniversary, so he calls Aarti back and tells her he was planning to “surprise” her with a visit. He asks her to make dinner for the two of them. This cheers her up immensely (unsurprisingly since she has already demonstrated an inability to learn); but since I do have that ability I am sure he won’t show up. And he does not, prevented once again by work issues. Aarti mopes for a while, and then decides to kill herself. Vinod, who has been watching her from his cottage on the grounds, follows her and stops her. This is a rare sensitive moment in the film, where both Raakhee and Shashi actually showed up for work, and it’s very poignant. The next day, unable to express his feelings to Aarti in person, Vinod writes her a very sweet and thoughtful letter. At this point the movie takes a hard 180° turn from poorly done Mills & Boon territory into OTT psycho-stalking ridiculousness, and Aarti and Radha turn into the stupidest women on the planet. Aarti seems startled that Vinod would think she’s lonely and sad (massive *eyeroll*); and despite the fact that he has never been anything but kind and respectful towards her, now decides that he is a threat to her. The background music changes from “Pal Pal Dil Ke Paas” into screeching “danger danger!” sounds and rolls of thunder while rain and lightning lash outside the windows. 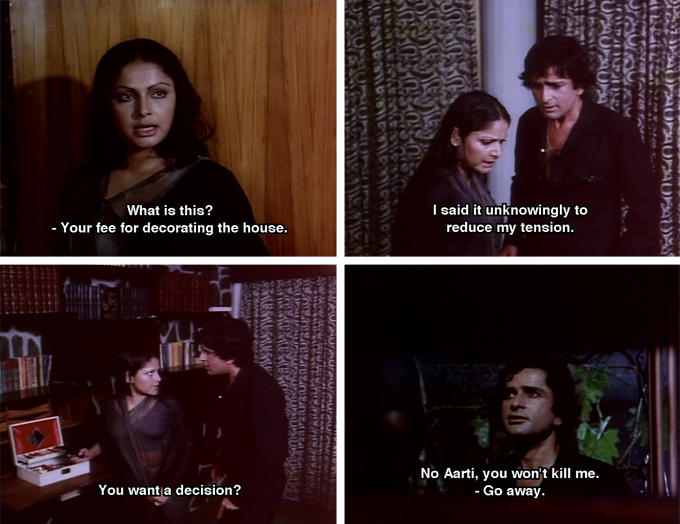 Aarti imagines a scene where Sunil arrives and Vinod confronts him. This so distresses her that she calls Radha and asks her to come over. Then she notices the lights going on at Vinod’s cottage and goes down to talk to him. Well, really, it’s more that she insults him and tells him to go away. He not unnaturally wants to discuss things with her since she has been encouraging him, and follows her to the house where the whole film goes completely off the rails. He points out that she herself had said that she wishes she’d had a life with him instead, and that it’s what he is offering here (society be damned! yay for him!). She admits saying it but insists that he’s misunderstood her; then she grabs Sunil’s gun and threatens to shoot herself. When he struggles to stop her the gun goes off and he ends up at the bottom of the stairs with blood pouring out of his head. Radha arrives and goes completely berserk, which is pretty much the last thing Aarti needs at this point. They put Vinod’s body in the car and dump him into a ravine some distance from the house. I bang my head on the arm of my chair. When Sunil FINALLY arrives in Khandala the next morning, he finds a different Aarti from the one he is used to. She’s jumpy and unresponsive to his advances, and when his assistant Chaturvedi calls from Bombay she tells Sunil he should go back. Then the Major brings none other than Vinod to be treated by Sunil after he is found wandering in the woods. Oh boy. By now I am completely fed up with what an incompetent mess this movie is, and I begin to think of plot developments I would like to see, like Shashi as a Zombie Interior Decorator. We’ve already gone from love triangle to suspense thriller, why not toss horror into the mix? I’ll bet the Shash would have enjoyed that more too, especially since he plays the rest of this out as listlessly as anyone possibly could (he’s lost his memory, which apparently makes you robotic too). If you even care anymore whether Sunil ever wakes up and smells the coffee, or whether Aarti realizes that she’s holding onto a jackass in a bad wig for the sake of a marriage that makes her miserable, or whether Vinod ever regains his memory and realizes that there’s probably someone prettier and less whiny over here in the United States, then watch this movie. If you want to see Radha (whose name changes mysteriously in the subtitles to Vidya right about now) give her sister wrong stupid hysterical advice, and to see Sunil’s reaction when he finds “evidence” of Aarti’s non-existent affair with Vinod, watch this movie. If you do, however, I suggest you have some sort of drinking game planned to get you through it (Aarti weeps: drink! Radha says something dumb: drink! Aarti says something dumb: drink! Sunil is insufferable: drink! Shashi obscures his dazzle with hideous sunglasses: drink!). 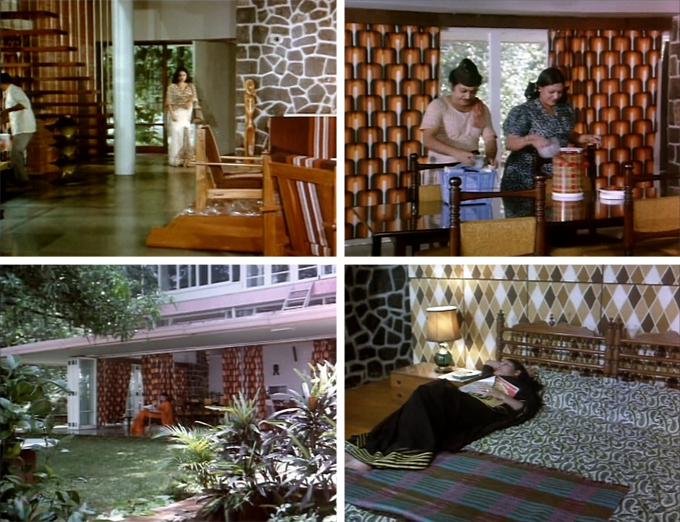 Oh, and the Khandala house looks a lot like the Cat Wall-Hanging House but isn’t, although it’s an eyeful on its own thanks to the Zombie Interior Decorator. Posted on May 3, 2012 at 5:31 pm in Hindi movies	| RSS feed You can skip to the end and leave a reply. Hi Memsaab recently discovered memsaabstory and as a lifelong Hindi movie fan am finding your blog very refreshing and enjoyable. I think I’ll give Trishna a miss though. I really think that a zombie version of this movie would be a big hit, but only if directed by you Greta! I’ll write it but I think directing is outside of my skill set! Great review as always though the movie may not get the same appreciation from me. Ah Trishul…that funnily enough was the film which made me realize why Sanjeev Kumar was popular, although I didn’t love the movie. I do love, love, love the opening song though. One of my all-time favorites. No wonder, the opening song is sung by a classically trained singer – Yesudas. I don’t know if you have mentioned him in any of the blog posts. In my analysis, he’s the Manna Dey of the Malayalam Film Industry. And Khayyam, the music director of “Trishul”, I am yet to come across a song of his which I am indifferent to. Even if its the most obscure movie, I just love ALL his songs…. Khayyam is the first Hindi music director whose name caught my attention, because I so loved the music in the movies he wrote for. What an AWESOME review this is, memsaab!!! I’ve read a few awesome reviews here before but this is right up there!!! I was laughing SO much throughout this review – it is just BRILLIANT!!! I’ve seen this movie – and not so very long ago. And though I have a very poor memory (esp when it comes to movie plots), this one somehow seems to stick in my mind. I remember this movie being released in 1978 – that was a time I used to see lots of movies. But I never got to see this one then. So, I was really looking forward to it when i caught up with it not so long ago. I remember thinking “What a waste of such stars!”. And I was thinking in particular of Sanjeev Kumar and Shashi Kapoor, both capable actors who were totally wasted here. 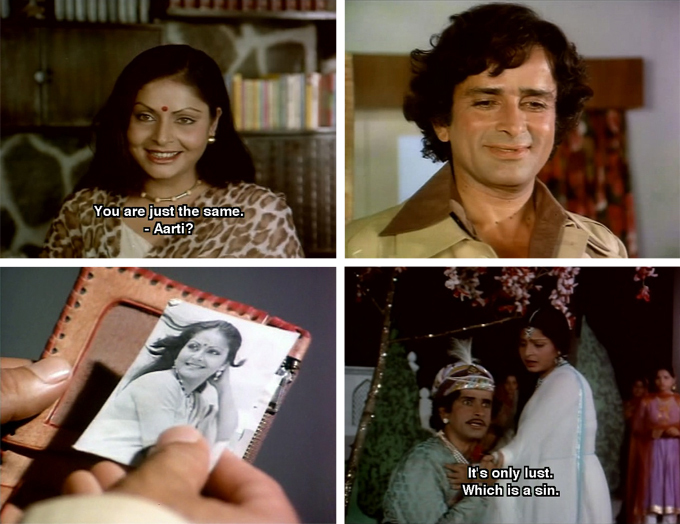 I was already expecting the Raakhee of 1978 to be weepy, so no surprises there. I sometimes tend to pick out specific lines from your review which I really, really liked. It’s difficult to do that with this one – it’s just one big laughathon. — I want to slap him silly from the get-go. Since her only reaction to all of this is passive-aggressive self-pity, I pretty much want to smack some sense into her too; so within five minutes I find myself detesting the hero-heroine, never a good sign. — This cheers her up immensely (unsurprisingly since she has already demonstrated an inability to learn); but since I do have that ability I am sure he won’t show up. — By now I am completely fed up with what an incompetent mess this movie is, and I begin to think of plot developments I would like to see, like Shashi as a Zombie Interior Designer. We’ve already gone from love triangle to suspense thriller, why not toss horror into the mix? I’ll bet the Shash would have enjoyed that more too, especially since he plays the rest of this out as listlessly as anyone possibly could (he’s lost his memory, which apparently makes you robotic too). — If you even care anymore whether Sunil ever wakes up and smells the coffee, or whether Aarti realizes that she’s holding onto a jackass in a bad wig for the sake of a marriage that makes her miserable, or whether Vinod ever regains his memory and realizes that there’s probably someone prettier and less whiny over here in the United States, then watch this movie. If you want to see Radha (whose name changes mysteriously in the subtitles to Vidya right about now) give her sister wrong stupid hysterical advice, and to see Sunil’s reaction when he finds “evidence” of Aarti’s non-existent affair with Vinod, watch this movie. I guess it’s sad but true that I am better at making fun of things than I am at conveying appreciation for quality :D I’m glad you enjoyed it. good review. dont remember seeing this movie, but a lot of movies in the 70s and 80s used to handle the romance triangle in a OTT way, i.e. Pati Parmeshwar category. Always one of them had to die (usually in a fire or with a bullet) so that the other two lived happily ever after. I am happy to report *SPOILER* that nobody dies at the end of this one, maybe one of its few blessings! 1. the “brains brains must have brains” quote and the touched up image. 2. or whether Vinod ever regains his memory and realizes that there’s probably someone prettier and less whiny over here in the United States, then watch this movie. :-D LOL! :))) Shashi could have had a great separate career from all his others in horror films! Yes, that stage act was priceless. And I must say that Shashi looked FINE in his Mughal turban! I saw this once when i was ten years old…i found the plot a bit complicated back then, but your review is just HILLARIOUS!!!!!!!!!! Have seen this movie twice, from the zombified Shashi Kapoor part and wondered if indeed this was Trishna and also noting that Bindu had a non-vampish role. There was this dreadful pining number in it too – Dinbadin woh mere dil se kyon door door hone lage – I remember it from the Sunday afternoon radio programme and my mother getting an earworm. Maybe a shot in the head was just what this interior decorator needed to design better. You make us laugh through all this pain, thanks. In that picture where she’s wearing the leopard-print sari (!!! want), Rakhee looks SO MUCH like Michelle Pfeiffer to me! I vaguely remember reading about this on PPCC and my word, how terrible it sounds. But as everyone always says, you do have such a flair for making the unwatchable un-put-down-able. :D And of course I will have great fun with zombie Shashi (or America-landed Shashi). Raakhee always looks gorgeous to me, I think she is absolutely beautiful. They did have nice clothes, although the men…arggghh. Why would Shashi wear those huge sunglasses? And Sanjeev’s wig…ugh. And of course it made no sense that she would resist the Shash, it never makes sense. I always get confused between Trishna and that other Rakhee film, where she sacrifices her life for her siblings. I think both are bad! Love your horror-film twist! That would surely pepp up things there! Rakhee’s film where she sacrifices her life for her siblings was, `Tapsaya’. I saw Trishna in a theater in late 70’s. I found it refreshing from the typical masala movie and enjoyed it. My wife saw the movie about 6 years ago and hated it. There must be other people who saw it in the 70’s and liked it, because it was different! I hope I am not the only one phew! Great review as usual! 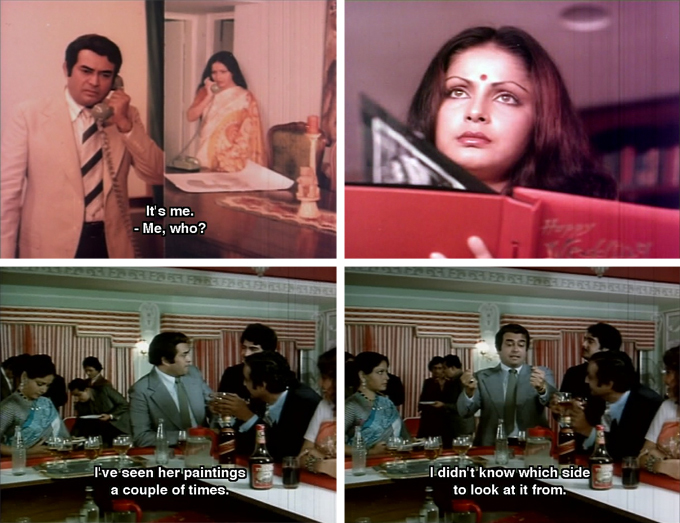 I watched Trishna as a kid on some TV channel or other (that’s what happens when your mom lets you watch an obscene amount of TV with zero supervision!). I don’t remember much about it but I do like the song Din ba din woh mere dil se. LOLLLLL!!! Bless your mother. Mine wouldn’t let me watch television at all for a long time. Hey this seems like a very poor copy of a hit Pakistani film.I dont remember the name now but the film starred our top stars,Shabnam and Waheed Murad and was a very big hit made sometime around the mid 70s. I wish Pakistani films were more widely available (with subtitles!) :) I’m hoping to be able to provide some older ones via Edu Productions one of these days! TRISHNA,an OCT 1978 release from banner of GP/Ramesh Sippy,though directed by Anil Ganguly,Three plus Two,finest underplayed performances,as per requirement of script,by Sanjeevda/Shashida,Rakhee aunty with same jest by SUJITDA/Bindu aunty,one Loction(KHANDALA) outstandlingly captured by cameramen not to forget one specfic song on Rakhee aunty,the story in brief,SHASHIDA/RAKHEE aunty are togther in college,with onesided atttachment from SHASHIDA,s side years latter they come across each other,though now married(Rakhee) with SANJEEVDA,and SHASHIDA still single(like me),An overbusy doc.giving more conisderation towards his pro,n.thus rift.The entire movie educates that with strong content,and without spending mindless,uncalled for money,one can still came with flying colours,as in this movie,if one goes deep,that Anilda,s every movie apart from firstone(KORA KAGAZ) 1974,every movie had RAKHEE madam in them,arare thing.Those days it use to content nowdays its collection which matters,watchout this one ,a rare gem.RAVINDER MINHAS .minhas35@yahoo.com.